PVC Sheet Machine - Shine Kon Enterprise Co., Ltd. 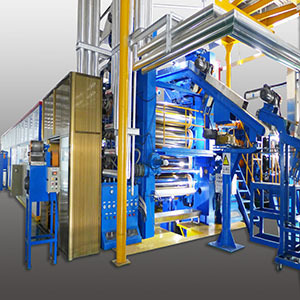 Shine Kon's PVC sheet machine is the flexible and transparent film plant equipment. It is suitable to produce flexible and transparent PVC film and sheet. Established in 1983, Shine Kon has developed advanced techniques and plenty experience for calender line whole-plant equipment. Our hi-tech electrical control skills can meet all your requirements. Furthermore, we can design and manufacture the PVC sheet machine depending on customers' specific requirement and demand. Polyvinyl chloride, namely, PVC, is widely applied in construction for its cheap price. Also, it can become softer and more flexible by adding plasticizers. Our pvc sheet machine can form flat sheets in a variety of thicknesses and colors. The flat sheets can be expanded to create voids in the interior of the material, providing additional thickness without additional weight or cost. If you are interested in our equipment, please feel free to send your inquiry to us anytime. The equipment is suitable to produce flexible PVC and flexible PVC transparent film and sheet etc.